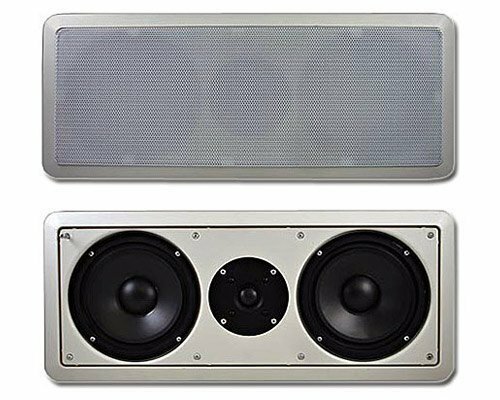 This Acoustic Audio by Goldwood speaker is the perfect addition to any home theater surround sound system because it's mount seamlessly into any wall and will not take up additional floor or shelf space. The center channel speaker can handle 300 watts of power (150W RMS power) and features (2) 6.5" high rigidity polypropylene woofers and butyl rubber surrounds with extended throw drive assembly to deliver ultra quick bass response and defined musical accuracy. Films and soundtracks will never sound better because of the speakers' 12mm soft dome tweeter, which provide for ultra-smooth voices and precise separation between instruments. Installation is easy with the quick-turn mounting arms that lock into place. The grill can be painted to match any individual interior. Speaker wire is included.